How do we have emotions? Why do emotional states feel like something? What is the relation between emotion, reward value, and subjective feelings of pleasure? How is the value of a good represented in the brain? Will neuroeconomics replace classical microeconomics? How does the brain implement emotion and decision-making? Are gene-defined rewards and emotions in the interests of the genes? Does rational multistep planning enable us to go beyond selfish genes to plans in the interests of the individual? 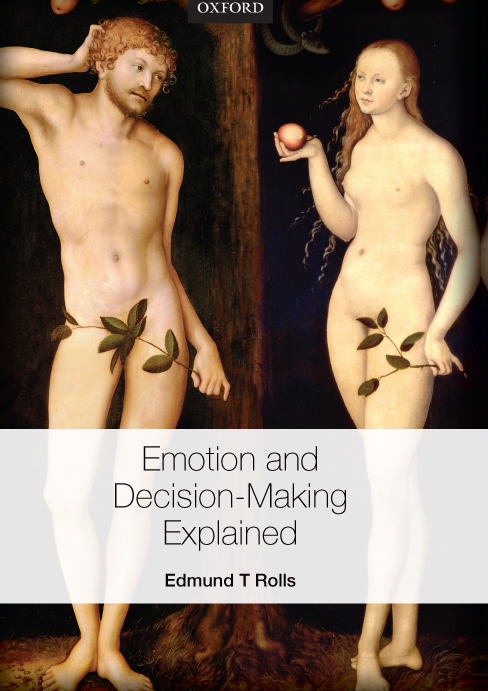 This book seeks explanations of emotion and decision-making by considering these questions. The book provides a unified approach to emotion, reward value, economic value, and decision-making, and their brain mechanisms. The evolutionary, adaptive value of the processes involved in emotion, the neural networks involved in emotion and decision-making, and the issue of conscious emotional feelings are all considered. Emotion and Decision-Making Explained will be valuable for those in the fields of neuroscience, neurology, psychology, psychiatry, biology, animal behaviour, economics, and philosophy from the advanced undergraduate level upwards, and for all interested in emotion and decision-making. The picture on the cover is ‘Adam and Eve’ painted in c. 1528 by Lucas Cranach the Elder, which provides an early interpretation of early human emotions, and emotion-related decision-making. This book provides a more recent, scientific, approach to emotions, and to decision-making.